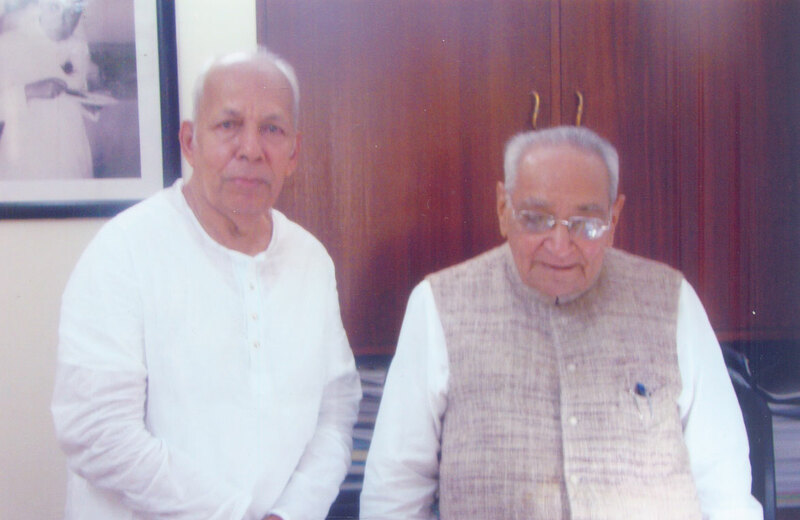 V. Isvarmurti is a leading senior Indian Congressman, intellectual and thinker. He is a former member of the then Madras Legislative Council. He had his education at such reputed institutions like Tagore’s Santiniketan and Oxford University. Soon after his education he joined the Indian National Congress in the year 1961 with a view to devote himself full time for politics. In that capacity he had worked with Indian leaders like K. Kamaraj,Atulya Ghosh, Sadiq Ali and others. He came into contact at an early age with leaders like Pandit Jawaharlal Nehru who was then the chancellor of Viswa Bharathi University, Santiniketan. This has directly shaped his political outlook, philosophy and beliefs. In later years he came into personal contact with leaders like Indira Gandhi, Moraji Desai and Chandrashekar who were all later to become prime ministers. While at Oxford,he actively participated in the Oxford University Debating Union. He became a member of the Oxford University Labour Club and turned into a Fabian Socialist. He came into contact with leading Socialists and Labour leaders like Kingsley Martin (then editor of the famous Socialist weekly “New Statesman”), Sir Julian Stratchy, Victor Gollanz and others. He was also the president of the Oxford University Indian students association. In that capacity he invited leading British politicians and public figures to visit Oxford and speak to Indian students. The list of the eminent British scholars, intellectuals and public figures whom V. Isvarmurti got to know and cultivate is long. A few names stand out: Sir A.J Ayer, Sir Isiah Berlin, Sir John Hicks, Sir Roy Harrold , Lord Anthony Quinton (who was also his tutor at New College, Oxford), Sir C M Bowra (Greek scholar and critic), W.H Auden, Stephen Spender, Dom Moraes, John Lehman (then editor of London Magazine). Incidentally during V.Isvarmurti’s Oxford undergraduate years (New College, 1959 to 1961) Dr. Manmohan Singh was a research scholar at Nuffield College. Another distinguished economics scholar then at Nuffield was Dr. Jagdish Baghwati. One long time friend of V. Isvarmurti is professor Amartya Sen (now the Nobel Laureate). He knows Prof Sen from his days at Santiniketan and the friendship continued at Trinity College, Cambridge and back in India. After Oxford, he travelled to India via Europe and Soviet Russia.He wanted to see first hand the working of communism in these countries. During this travel he went from St. Petersberg to Moscow to Tashkant. He met many a cross section of young and other distinguished people including the family members of Boris Pasternak. Once in India he threw himself full time into Congress party politics. He was invited to New Delhi in 1963 by Atulya Ghosh (then Treasurer of Congress Party) to join the All India Congress Committee to edit a magazine to propogate the party ideals when Pandit Nehru was very much around. In 1967, during the general elections he was called again by Atulya Ghosh to the AICC to write the phamplets for the general elections on the party’s ideals and programs. It was during this period that he came into close contact with K. Kamaraj,Sadiq Ali and other Congress leaders like Gulzarilal Nanda. In 1968 he was elected as an Independent member to the then Madras Legislative Council defeating all the party candidates including those of the Congress and DMK when C. N Annadurai was the Chief Minister.During this MLC years he introduced two notable Private Member Bills. One, to fix the term of the vice chancellor of the Madras University. An outcome of this bill was to end the 27 year old tenure of Sir A. Lakshmana Swamy Mudaliar – the legendary figure in the then Madras Presidency. The second bill was to establish a separate Tamil University to promote Tamil language and studies by affiliating the existing Tamil colleges. Later this became the Tamil University in Tanjore though in a different form. 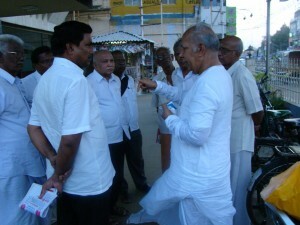 During this period, V. Isvarmurti led various agitations for public cause. One was the famous farmers agitation in 1972 during which he served 22 days in jail for the farmers cause. Another prominent agitation was that of the Graduate Teachers in 1972. In 1962, one of his first public service activities was to establish a full fledged high school in his native village in Pichanur near Coimbatiore in Tamil Nadu. For this he donated his own lands and created an endowment. This school was called the “International School” and had many progressive features. It had two US Peace Corps volunteers and also US volunteers from the American Quakers serving in the village. Mr. V. Isvarmurti from an early days was interested in writing. Literature, poetry, drawing and painting always interested him. His interest in writing, journalism and public life lead him to launch many journals and publications from early age. For a long time he has been a keen observer and an active participant in the many changes that come about in Indian society,politics, economy and the thought processes. He has written numerous books in English and Tamil. His articles & commentaries range on a wide variety of fields. The purpose of this website is to compile all his different writings so as to create a body of knowledge for anyone interested in an independent and critical insight into evolution of Indian politics, economy, agriculture, rural development, entrepreneurship, society and philosophy. Today he spends his time in Bangalore where his media company activities are headquartered. He travels to his village in Tamil Nadu where his farming and social activities are focussed. Pachaiappa College studied Tamil D Group under Dr.M.Varadarajan, later Vice-Chancellor, Madurai University. Santiniketan, West Bengal : (M.A.Visva Bharati University) Became acquainted with Dr.Amartya Sen, Nobel Prize winner in Economics. Returned to India travelling through Sweden, Finland, Russia, Afghanistan, Pakistan. Started a public life as Member of Madras Legislative Council 1968-1974. Founded a secondary school in a rural interior in 1962 soon after coming down from Oxford. Sarvadesa Kalvi Kazhagam, Education Trust in 1962, Pichanur Village, Coimbatore District. Donated ancestral lands and property to the Society to start a high school in the region. Founded the Sarvadesa Kalvi Nilayam, International High School, an aided secondary school. Opened by NSS Mandradiar, the then Cooperation Minister, Government of Tamil Nadu. 16th June 1963. Worked at the All India Congress Committee, New Delhi Under Kamaraj, President, Congress Party and Atulya Ghoash, Congress Party Treasurer, Written Congress Party General Election Party manifestos and Party pamphlets. Contested and elected as an Independent Member, Tamil Nadu Legislative Council from the Coimbatore, Salem, Dharmapuri, Nilgiris Graduates Constituency. (i) Agriculture & Industry Survey, started as an annual publication. Now a popular monthly since 1996. (ii) School – Journal of Education, a monthly. Vadamalai Media Group companies now publish other language newspapers/journals in Tamil, Malayalam & Kannada. Valarum Tamizhagam (Tamil) Ayswarya Keralam (Malayalam) & Ayswarya Kannadanadu (Kannada). (iv) A book on Autobiography in Tamil in manuscript form – The price I paid for my freedom is big. Chairman, Vadamalai Media Group, Bangalore/Coimbatore. i went through your blog its really impressive. being an engineering under graduate i have less idea about the politics. i am in himachal pradesh far off from your place, somehow it’ll be my pleasure to see you sometime. Hope the web manager allow this this to reach the concerned. I am saravanan from Trichy, me and my wife Mrs. Akila, we both of us met you on 04.06.2013 in Ooty near Garden during morning walk hours. We are very happy afer met you. We both talk about the present education system and politics. We gained lot of information from you. and we talk about Mrs.Prema Nandhakumar,Trichy. Its amazing to look over the blog. much more helpful to peoples those wants to know in diff fields. I am very sorry for such a long delay in responding to the comments on the blog. I am looking forward to seeing you again in Lawrence School this Summer. Let us be in touch with each other. You are blessed to have the opportunity to work with great patriotic leaders like Perunthalaivar K.Kamaraj. Your capability is seen from your diversified activities. Your knowledge, your qualification and your acts are the model for the younger generation. I am thrilled to see your ability. Simply you are great. Hi, Sir, I read the articles mostly from1985,found very sharp in the aim what you are focussed,All your efforts once upon a time world will appreciate, we are proud about the old days,all the best. big salute. For a long time I was trying to contact you after retiring from Pondicherry university in 2013 and the B S Abdur Rahman university chennai. I was the only VCto head three universities and turning all of them into A grade accredited universities. I sir I am now settled at Mysore and I have taken the responsibility of a Society which I had founded in 1973(Muslim education society. Mysore) as its president. One reason I wanted to meet u was to let you know how I am persecuted three years after my leaving with an unparalleled contribution to The university and nation. சென்னை பல்கலை கழக துணை வேந்தர் பதவிகாலம் குறித்து நீங்கள் கொண்டுவந்த தனி நபர் தீர்மானம் மற்றும் தமிழ் வளர்ச்சி பலகலை கழகம் குறித்த தீர்மானமும் அந்த காலத்தில் சமூகத்தின் மீது அக்கறை கொண்டவர்கள் இருந்தார்கள் என்பதை காட்டுகிறது. தற்போது நம் நாட்டின் நிலை மிகவும் பரிதாபமாக இருக்கிறது. காமராஜ் தொண்டர்களால் கண்டிப்பாக மாற்றம் கொண்டு வர முடியும் என்று நம்புகிறேன்!